Based on the Eventide Reverb 2016, this plug-in sounds amazingly natural and works especially well on drums. 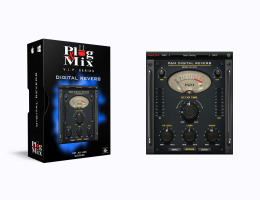 Choose between small, medium and large room size for convenient reverb effects sculpting. The ER Level knobs allows you to control the levels the Early reflections while Lows and Highs dial in the tone of the reverb. The big Decay Time knob controls the length of the reverb while the mix and output knobs reside in the upper left and right hand corners. Decay Time - Increases the time of the Reverb effect. ER Level - Controls the early reflection levels. Selector buttons - Choose between Small, Medium or Large room sounds.